There is a lot out there on the internets about the qualities of a good boss. Inc ranked their top 10 traits of a good boss as Empathy, Trust, Loyalty, Discernment, Insight, Character, Reward, Relationship, Honor, and Conviction. Ok sure. We agree with that (even if our inner SLPs want to nitpick that those words aren’t, you know, traits). Forbes says that things like playing “chess not checkers” and being “a port in a storm” make bosses “unforgettable.” We definitely agree with both of those things, but we’re not sure that being unforgettable is really the goal when it comes to being the leader your people need in order to do their very best work. What we’re really curious about, actually, is what should leaders be doing. What are the actions that people in leadership positions should be taking, every day, to nurture a culture that allows people to try new things, to fail, to get up and try again? A culture of trust and courage that attracts and retains people committed to doing their jobs with their whole hearts. So, we’re asking. Which 3 action items listed below do you believe are the most important for school leaders to do? Perhaps not shocking to see that our team, the majority of whom are SLPs, ranked making open lines of communication in the number one spot. But what about the others? Do any of them surprise you? 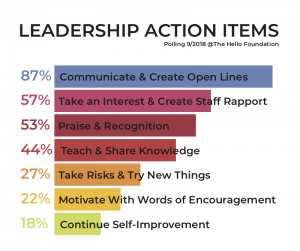 Do the results of the poll in this post and the Hello internal poll align with your practice as a leader? Share your thoughts with us!